When it comes to achieving the perfect smile, you want to make sure you’re in good hands. While dentists and orthodontists have a lot in common, specialisation is what sets an orthodontist apart. If you’re not sure whether your practitioner is a specialist orthodontist, there are a few easy ways to find out. You might be thinking, ‘how do I find a specialist orthodontist near me?’ Every full member of the Australian Society of Orthodontists is a registered specialist orthodontist. As an organisation, we are committed to delivering excellence in patient care and continuing the education of our members to ensure we’re always at the forefront of the latest scientific developments and techniques. When seeing a registered ASO orthodontist, you can feel confident in their specialist knowledge and expertise. Our Find an Orthodontist tool helps you to locate your nearest practitioner, safe in the knowledge that they are qualified to the highest standards. Alternatively, at your next dental check-up you can ask your trusted family dentist to recommend a specialist orthodontist in your area. 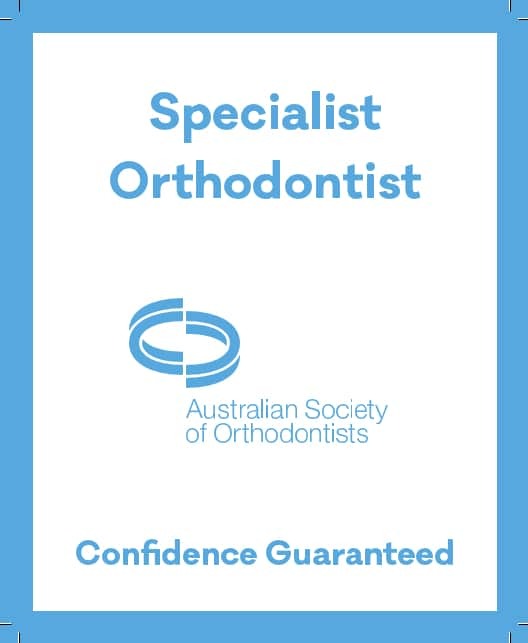 Most members of the Australian Society of Orthodontists display a sticker or sign in their window which shows they are member of the ASO and therefore a registered specialist orthodontist. Keep an eye out for the light blue logo in the window of your orthodontist’s practice. The Australian Health Practitioner Regulation Agency website has the details of all registered health professionals in the country, including general dentists and dental specialists such as orthodontists. You can easily search their records to find out your practitioner’s credentials. Look for the registration type ‘Dentist – Specialist’ to confirm they are an orthodontist. It’s always best to check whether or not your orthodontist is a registered specialist with an independent organisation. However, as a final option, the receptionist at your orthodontist’s practice may be able to help if you’re still not sure. Why should I visit a specialist orthodontist? Your smile is one of your most important features and the first asset you present to the world, so you want to make sure it is in the best hands with a fully trained specialist orthodontist. If you’re self-conscious about the state of your teeth, then an orthodontic treatment plan can help restore confidence to your smile and help you live a happier, healthier life. There are many reasons to visit an orthodontist. You might make an appointment to have your crooked teeth straightened, reduce gaps or correct misaligned teeth. An orthodontist can help with misaligned jaws or bite problems that can cause pain or clicking while chewing. Your orthodontist may also be able to help in some cases of sleep apnoea or to correct issues caused by prolonged habits such as thumb sucking as a child. Orthodontic treatment (including braces and clear aligners) should ideally be provided by a registered specialist orthodontist. Orthodontists have the skills and expertise to correctly diagnose orthodontic problems, assess and monitor your tooth movements and safeguard the health of your teeth.